I thought today would be fitting to make this post on my first ever MAC products that I have ever purchased. For my #TBT aka #ThrowbackThursday, I will be featuring these two lip products I bought from MAC at the same time as my first ever MAC products! 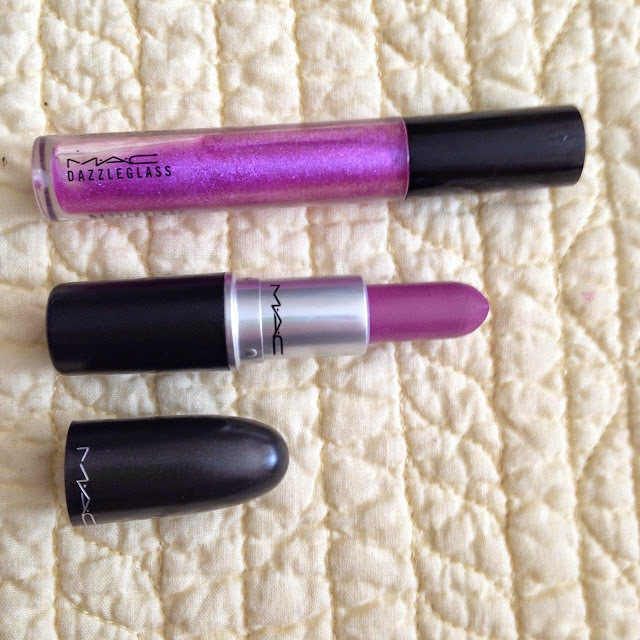 Being obsessed with the color purple and all, I found it fitting that my first lipstick from MAC would be a purple one. I looked and swatched a few and when I actually put Up the Amp ($16) on my lips, I instantly fell in love! It was such a beautiful color and a very wearable purple. It smelled nice and the amplified formula glided onto my lips very nicely. I kept it on the whole day! Then the lady at the MAC counter asked if I wanted anything else--I had also been eyeing the Funtabulous ($20) dazzleglass. There is just something about the shimmery/glittery purple gloss that called out to me and I thought, "why the hell not?!" That one came home with me too and I love it too! I liked adding it on top of the lipstick (and other lipsticks) and it is even pretty on its own! The lipstick is a nice purple color with some pink undertones. 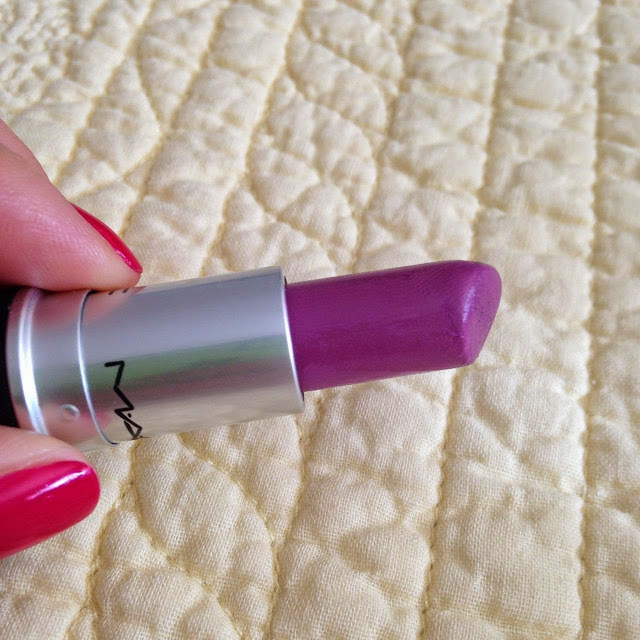 It glides on nice and smooth and is one of my favorite finishes in MAC lipsticks. This gloss is by far one of the prettiest glosses. It doesn't have your typical sponge tip/doe foot applicator, but a brush applicator which I actually do like. The color is so vibrant and packed with a lot of mini micro-glitter. This is definitely a more sticky formula so if you don't like that texture on your lips, stay away. I, however, really do like sticky glosses and find they stay on my lips longer. The swatches below are in natural lighting indoors. The top one is Up the Amp amplified lipstick . The middle is the Funtabulous Dazzleglass. 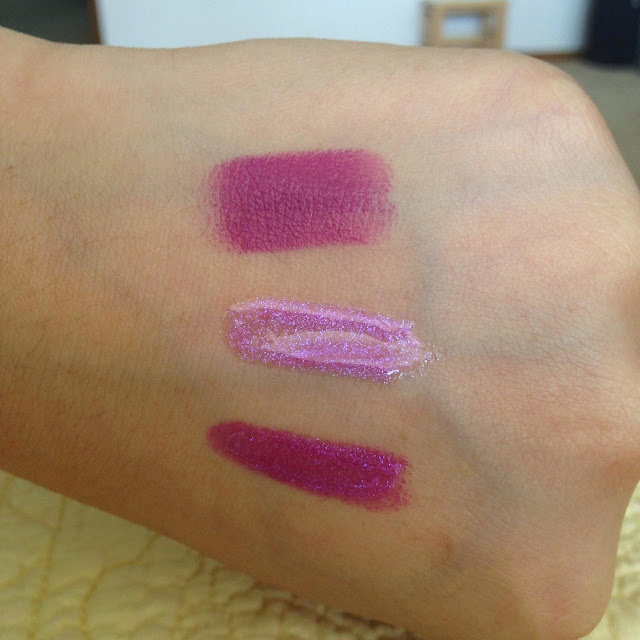 The bottom one is the gloss layered over the lipstick. 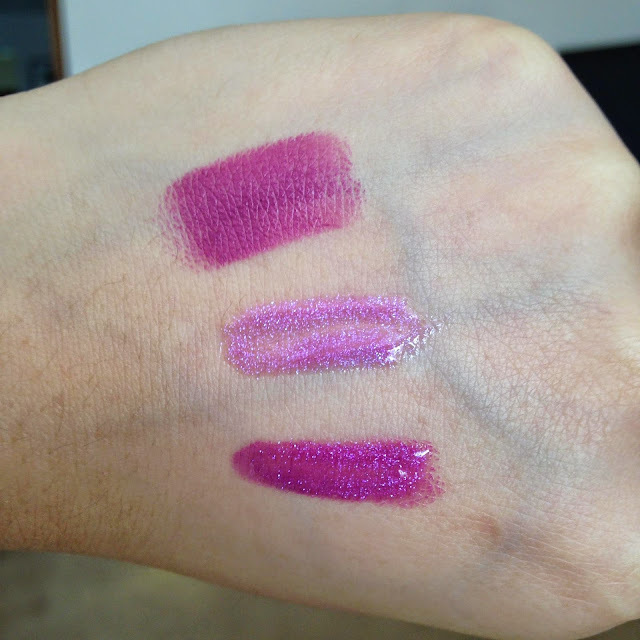 As you can see rom the swatches, the purple color in the lipstick is nice pigmented and the gloss is sheer yet packs color and sparkle. When they're layered together though? I think they just make for one of the prettiest combinations! For those that want to get into purple lipsticks but don't want to go too purple or too bold, then Up the Amp would be perfect for you! It isn't too intimidating of a color and really can be worn everyday and even sheered about a bit with some gloss on top. It can be really vibrant for night time too and with the sparkly Funtabulous dazzleglass on top? Even better! And if you are a fan of purple lips in general, this one is nice to have! Do you remember your first MAC purchases?! Have you tried out these two products? Let me know in the comments below! These are really pretty colors together! Great pairs. Ooh I don't think I've ever seen Violeta, looks like i'll have to check that one out! Haha i'll pretty much pair purple lips with almost anything I wear just if I feel like it, but I love it when I have a simple outfit that is mainly black/white/grey. It adds the perfect pop of color, anddd Purple is my favorite color haha so I have some biased about that too.